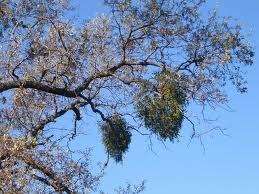 Mistletoe is a native plant to England and grows abundantly down south. It even grows in North East Lincolnshire at four sites around the county. This makes it a rare herb for our region. I use mistletoe in my practice and recently purchased some fresh berries to grow on my apple tree in my garden. It is this recent planting of Mistletoe which inspired me to write about this mystical herb. 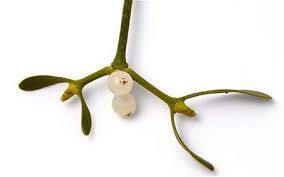 Mistletoe is also known as Churchman’s Greeting, Kiss-and-go, Masslin, Misle and Mislin-bush. It is a semi-parasitic plant as it roots itself under the bark of tree branches but can produce enough energy from photosynthesis from its leaves to sustain itself. The scientific name – Viscum album gives an indication into the plant (which we all know from Yule traditions) Viscum can be translated as sticky and album – white. Sticky white is a perfect description of the berries – especially if you have ever squashed one of them 🙂 Also Mistletoe can be translated using the Anglo-Saxon language – mistel, meaning dung, and tan, meaning twig. Mistletoe has a narcotic effect on birds. Birds who eat the berries off the twigs do have a psychedelic experience. The sticky white sap covering the berry doesn’t get digested easily so when it is passed from the bird (hopefully on the branch of a rose family tree) it can then stick to the branch and hopefully take root – dung on a twig!! As a herb please NEVER self-medicate with Mistletoe – all parts of the plants contain toxins and the plant is considered unsafe with use restricted to qualified professionals such as myself. 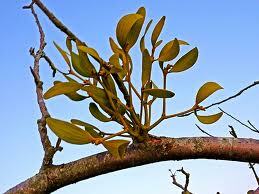 Mistletoe poisoning can occur when someone eats this plant. Poisoning can also occur if you drink tea created from the plant or its berries. Raw, unprocessed mistletoe is poisonous. Eating raw, unprocessed European mistletoe or American mistletoe can cause vomiting, seizures, a slowing of the heart rate, and even death. Despite this I do use this herb as I have been trained, I understand how to use it, who it would benefit and how much to give. I have found it to be a great herb to help with insomnia, epilepsy and arterial hypertension (high blood pressure). Mistletoe is antispasmodic and reduced blood pressure which makes it beneficial for someone with epilepsy. At university we were taught that it was a bit like Alice in Wonderland going down the rabbit hole. We can hide from our emotions and repress certain things with a negative outcome on our health and wellbeing. 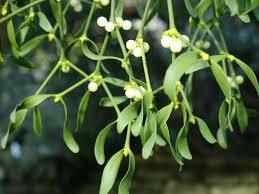 Mistletoe is a nervine and a narcotic which has a profound effect on our nervous system. Mistletoe can help us to reconnect with the emotions and situations that we repressed and then we can work on them, resolve them and feel a hell of a lot better. This herb is also undergoing several scientific trials for its use as an anti-cancer herb. Juice of the berries have been applied to external cancers since the time of the druids but research is looking at internal use. There has been some success with this and it kinda follows the principle of like cures like (which is more homeopathic than herbalism) – the mistletoe is a semi-parasitic host and therefore would it not cure an unwanted growth? The tradition of hanging it during Christmas was to ward off evil spirits and ensure a good new year ahead. Myth and folklore also state that the herb is associated with peace and love, something we all want around Yule time. Mistletoe prefers to grow on members of the Rosaceae family preferring cultivated apple trees, lime, hawthorn and populars. They were seen as more sacred when growing on Oaks. To grow, squeeze a fresh berry and wipe the seed and glue on the side or underside of a branch which is at least 20cm in diameter. It is worth tieing some wool loosely where you have ‘planted’ the seed, this will also prevent them from falling off. It is worth ‘planting’ around a dozen a time although I only put two on my apple tree as I didn’t want it to be overrun. It will take a year before the seeds produce leaves and start to grow into a recognisable young plant. Each year, individual shoots produce just two new branches with one pair of leaves at the tip of each; so progress is slow taking four years before berries are formed. But I feel that it is worth it. This entry was posted in advice, cancer, cheap gardening, Complementary and Alternative Medicine, Do your bit, Environment, gardening, Grimsby, grow your own, health, Health and Wellbeing, Herbal Medicine, herbal remedies, Herbalism, herbs, history of herbal medicine, horticulture, how to, nature, trees and tagged druids, mistletoe by Herbs for Health and Wellbeing. Bookmark the permalink. Excellent goods from you, man. I’ve consider your stuff previous to and you’re simply extremely great. wait to learn far more from you. This is actually a tremendous site. I don’t drop many responses, but i did a few searching and wound up here Magical Mistletoe – Viscum album | herbsforhealthandwellbeing’s Blog. few of these comments look as if they are written by brain dead individuals? 😛 And, if you are posting at other sites, I’d like to follow anything fresh you have to post. your public sites like your twitter feed, Facebook page or linkedin profile? Hi there. I appreciate all comments from people, any feedback helps me to refine my writing and improve. and LinkedIn, GooglePlus and Instagram. My instagram tag is paganearthangel. and personally suggest to my friends. I’m sure they will be benefited from this website. than that, this is magnificent blog. A great read. I every time emailed this webpage post page to all my contacts, because if like to read it then my contacts will too.